When it comes to nearly any large purchase or investment, you shop around for the best product at the best price. The same is true of planning a chartered fishing trip. With a fishing charter, you want to find an experienced and professional vessel with knowledge of the fish and sea. Here’s a look at three key factors to consider when deciding on booking a chartered experience. One of the foremost considerations must be the captain’s experience. You don’t want to head out into the ocean waters with an inexperienced captain or someone who has very little experience fishing for the catches that you’re looking for. Capt. Chad Reyer of The Triple-Trouble is a lifetime fisherman, and has grown up on boats all along the Alabama coast. He’s seen it all – and caught most of it – and is the perfect person to lead you on your voyage to the Gulf to catch that prized catch. You also want to make sure that your vessel is safe and prepared for the unexpected or emergencies. The Triple Trouble is fully equipped with life jackets – even children’s jackets – to protect everyone on board in case of capsizing or falling overboard. In addition, the vessel has enclosed spaces – including staterooms and a living area – that are equipped with air conditioning and space to lay down in case the heat or rough seas make being on deck too uncomfortable. The boat also is equipped with a first aid kit to handle any cuts or scratches that you might incur while fighting the beasts of the deeps. 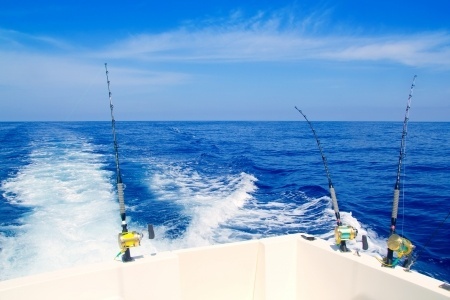 Lastly, you want a charter trip to take you to where the fish are, not spend all day lounging on the waves and hoping for a bite. With a lifetime of experience, Capt. Chad has intimate knowledge of the waters along the Gulf coast of Alabama and where fish congregate at different times of year. With his extensive intel, you’re sure to land on good fishing and will have no trouble at all getting fish on your lines. Be aware, though – a captain’s knowledge is his own personal secret, and anyone caught using a GPS aboard The Triple-Trouble will be in trouble! Capt. Chad and The Triple-Trouble are ready to take you, your friends and your family out for a fantastic trip filled with fishing, excitement and the spray of the open Gulf. For more information or to book your chartered trip, call him at 256-431-5767 or email Capt. Chad today.